A few weeks ago Nsefu received a radio call from Braston who was out on a game drive with his guests. 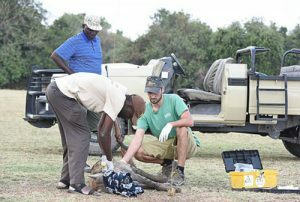 They had found a distressed spotted hyena with a huge wound on her neck. It looked like it had a snare but they were not entirely sure. We radioed the office to inform the ZCP (Zambian Carnivore Programme) team so that they could come out and hopefully find her. 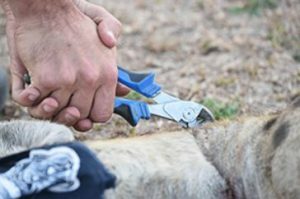 Soon after the radio call, Ben who is working for ZCP, contacted camp and we explained to him where the hyena had been spotted and that she was lying down – probably not going far because she seemed to be in a lot of pain. Our scout was on standby ready to help, and Ben and Mwamba the vet came up as quickly as possible. When they arrived at Nsefu we went straight out to the area where the hyena was likely to be. We walked around for a while unable to spot her but we had our very experienced Luangwa Bush Camping scout Chris with us and he suggested that we go and check the water puddles that are still in the Croc river. He was sure that the hyena would stay close to water because of her condition. We jumped into the vehicle and drove a little further, crossing the Croc river onto the Wafwa area, and sure enough there she was, crouched down in one of the puddles. Well done Chris! Mwamba and Ben discussed how to dart the hyena so that she would not run into thick bush but rather into the open area of the Wafwa. We approached the hyena. She was looking at us but did not move, so Ben positioned the vehicle in such a way that the bushes were behind us and the hyena would run into the open. 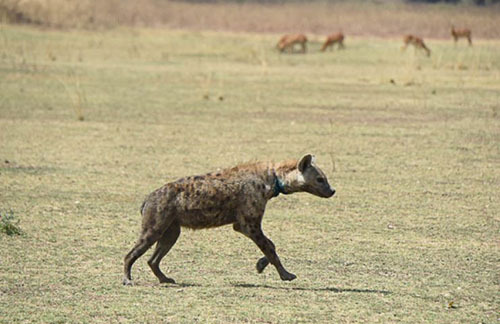 Mwamba aimed with his dart gun and fired the dart into the thigh of the hyena. He was very precise, the hyena jumped up and ran out of the river bed onto the open Wafwa. Soon she pulled out the dart but the fluid was already in her blood stream. She struggled to walk, her legs gave way and she collapsed. It could not have been a better shot. The puku and impala grazing on the plain looked rather puzzled at the hyena lying in front of them. We approached the hyena and waited for a few minutes to be sure that the drug was effective. Mwamba and Ben went to her first and put a handkerchief over her eyes to protect them from the sun. Then they examined the wound. It looked very deep and the snare was there. Ben cut it with a set of pliers, Mwamba disinfected the wound and injected some antibiotics. They measured her body temperature and her size. They also took some hair, a blood sample and a few pictures for their database. They worked hand in hand and very quickly. Once everything was recorded, Ben poured water over the hyena to keep her cool. Then Mwamba injected an antidote to wake her up. We all jumped into the car and drove away a little to give the hyena some space. She woke up after a few minutes, looked at us, tried to get up and started running. Her back legs were not quite carrying her yet but it only took a few moments and she was on her way. 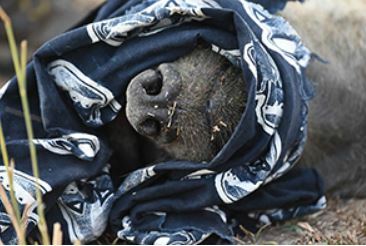 Mwamba and Ben are sure that she will make a full recovery, despite the very deep wound that she had. Hyenas are tough and have got a very strong healing system. But they said that another week with this snare and she would be dead. We are all very happy with the perfect teamwork between ZCP, National Parks and ourselves, and the life of this hyena got saved thanks to everyone immediately responding and getting into action. May she be spared of yet another incident like this in the future! Get weekly stories by Emily from the Zambian bush by signing up at Robin Pope Safaris.